Is your metabolism sluggish? Metabolism is the process of breaking down proteins, carbohydrates, and fats to provide the energy your body needs to maintain itself. Your metabolism rate is determined by many factors including, age, level of physical activity, the number of calories you consume, the foods you eat and the amount of water you drink. 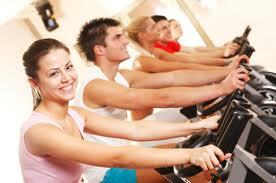 One of the most effective ways of boosting your metabolism is to increase your amount of intensive/aerobic activity. The reason being, is that your body is efficient and will burn carbohydrates first and then fat, if it is needed for energy. Thirty minutes a day, of intense exercise, five to six times a week is recommended for adults. Did you know that our bodies continue to burn extra calories after intense exercise or weight lifting for up to 24 hours? Also, being more muscular increases your metabolism as each extra pound of muscle you carry can burn up to 50 additional calories just to maintain itself! Now, I’m ready to go work out, how about you?